Tag Clips, Bead Chain, Meter Seals, Nylon Cable Ties, Split Key Rings, S Hooks | BB Tees Inc.
BB Tees, Inc offers a choice of different styles of wire tag clips for the purpose of attaching your metal, plastic or paper tags. 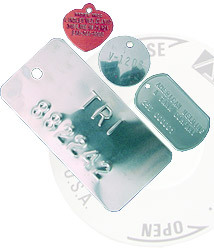 The tag clips allow you to easily attach your tag in a secure way that makes it difficult to come off. 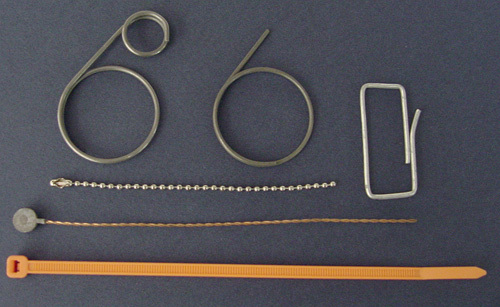 Some other types of attachments we offer are straight cut wire in stainless steel and galvanized steel, bead chain, lead meter seals, nylon cable ties, split key rings, S hooks and metal & plastic seals. Quebec QC, Ontario ON, Nova Scotia NS & more), Mexico, Central and South America and overseas. Located near Philadelphia, PA.